Microbial art, agar art, or germ art is artwork created by culturing microorganisms in certain patterns. The microbes used can be bacteria, yeast fungi, or less commonly, protists. The microbes can be chosen for their natural colours, or can be engineered to express fluorescent proteins and viewed under ultraviolet light to make them fluoresce in colour. Agar plates are used as a canvas, while pigmented or fluorescent bacteria and yeasts represent the paint. In order to preserve a piece of microbial art after a sufficient incubation, the microbe culture is sealed with epoxy. Microbe species can be chosen for their natural colours to form a palette for the artwork. Suitable species of bacteria (with their colours) include Bacillus subtilis (cream to brown), Chromobacterium violaceum (violet), Escherichia coli (colourless), Micrococcus luteus (yellow), Micrococcus roseus (pink), Proteus mirabilis, Pseudomonas aeruginosa (brown), Pseudomonas fluorescens (naturally blue-green fluorescent with pyoverdine), Serratia marcescens (pink or orange), Staphylococcus aureus (yellow), and Vibrio fischeri (bioluminescent). A technique called "bacteriography" involves selectively killing certain areas of a bacterial culture with radiation, in order to produce artistic patterns. After incubation, the culture is sealed with acrylic. Alexander Fleming, the man most commonly credited with the discovery of penicillin, was known for creating germ paintings. The biochemist Roger Tsien won the 2008 Nobel prize for chemistry for his contributions to knowledge of green fluorescent protein (GFP). 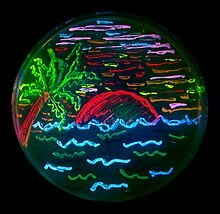 A researcher in his laboratory, Nathan Shaner, made a 2006 microbial artwork using GFP of a San Diego beach scene. The American Society for Microbiology hosts an annual contest for microbial art: Agar Art. The 2015 edition covered 85 submissions, of which microbial art created by Mehmet Berkmen and Maria Peñil called Neurons won first place. They have been working together since 2011 on making bacterial art. The artwork used yellow Nesterenkonia and orange Deinococcus and Sphingomonas. ^ The colour shown by the micro-organisms also depends on the medium used. ^ Torrice, Michael, ed. (6 November 2009). "Petri Dish Artists". Science. AAAS. 326 (5954): 777. doi:10.1126/science.326_777b. ^ a b c Palermo, Elizabeth (22 October 2015). "Microbe Masterpieces: Scientists Create Cool Art from Bacteria". Live Science. Purch. Retrieved 9 November 2015. ^ a b Dunn, Rob (11 July 2010). "Painting With Penicillin: Alexander Fleming's Germ Art". smithsonian.com. Retrieved 20 February 2018. ^ McGuinness, Ross (3 May 2010). "Putting art under the microscope". Metro. Associated Newspapers Limited. Retrieved 9 November 2015. ^ a b c "Meet the Microbes". Microbial Art. Retrieved 12 December 2016. ^ Mole, Beth Marie (19 October 2012). "Bacteriography". The Scientist. LabX Media Group. Retrieved 9 November 2015. ^ Cressey, Daniel (1 September 2016). "Roger Tsien's legacy: The creations that lit up biology". Nature. Retrieved 12 December 2016. ^ "Neurons". Archived from the original on 31 March 2016. Retrieved 12 December 2016. ^ "Announcing the 2015 ASM Agar Art Winners". MicrobeWORLD. American Society for Microbiology. 2015. Archived from the original on 29 October 2015. Retrieved 9 November 2015. Wikimedia Commons has media related to Microbial art. This page was last edited on 9 March 2019, at 22:53 (UTC).